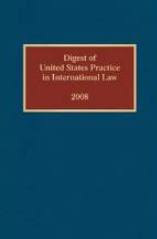 The U.S. Department of State recently posted on its website the electronic version of the 2010 Digest of United States Practice in International Law, covering developments during 2010. The print version soon will be available from Oxford University Press. Published annually by "L," the Office of the Legal Adviser at the State Department, the Digest is intended to provide the public with a historical record of the U.S. government's views and practice in public and private international law. Following a hiatus from 1989 to 1999, publication of the Digest resumed in 2000. Since then, annual volumes for 2000 through 2010, a two-volume set covering 1991-1999, and a volume for 1989-1990 have been published. All are all available on the State Department website, here. The Digest may be traced to an 1877 treatise by John Cadwalader; it was followed by multivolume encyclopedias that covered selected areas of international law. Later, the Digest came to be known as “Whiteman’s,” after Marjorie M. Whiteman (right), a career State Department lawyer who, as posted, edited the Digest from 1963 to 1971. ► Sally J. Cummins, who co-editing for a few years after publication resumed in 2000, and then acting as sole editor from 2004 to 2007. ► Elizabeth R. Wilcox, successor to Cummins and editor of 3 volumes, including the just-issued 2010 Digest. ► CarrieLyn Donigan Guymon (left), an IntLawGrrls contributor who, we're delighted to announce, has accepted the position of editor, beginning with the 2011 Digest.